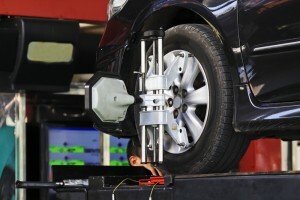 Is there more than one type of wheel alignment service ? You may have heard different terms used when someone is talking about a wheel alignment such as front end alignment, 4 wheel alignment, or 2 wheel alignment. Do these things mean the same thing? Yes and no. They are all types of wheel alignment services. Not all vehicles have adjustments for the rear wheels. In that instance it would be a Front wheel alignment or 2 wheel alignment. Do you know that when your vehicle needs a wheel alignment it can decrease fuel economy, wear your tires prematurely, affect the steering and braking of your vehicle ? How do I know if I need a wheel alignment ? Wheel alignments aren’t usually listed on the manufacturers recommended maintenance schedule. So you may be asking yourself how often should I have my car’s wheel alignment checked ? The answer is annually even if you do not suspect there is a concern. Wheel alignment checks should be part of your preventative maintenance routine. This is so you can potentially catch a problem BEFORE it wears your tires, BEFORE it causes premature wear to the suspension and or steering of your car, BEFORE it reduces the safety of your car, truck, or SUV (such as less responsive steering or longer braking distance). You should also have a wheel alignment service done when you buy new tires to ensure you get the longest life of the tires. Think about this, the average spent on tires is $700 give or take. If your vehicle is out of alignment you are potentially throwing that $700 right out the window! When a car, truck, or SUV is new, the suspension and steering is set to a factory specification to minimize tire wear and to optimize the vehicles ability to corner and handle smoothly. Over time, a vehicles suspension and steering system get bumped, jostled, and beat on, often results from deteriorating roadways. That alone is enough to cause your car’s alignment to deviate from the factory specs and create poor handling and increased tire wear. You feel your vehicle pulling to one side when driving. If your steering feels unstable, loose, or just not quite right. Our state of the art alignment equipment will calculate the orientation of your tires, compare it to the manufacturer specifications for your vehicle. Then a trained technician will make the necessary adjustments based off of the alignment report to meet the manufacturer recommendations. The technician will also check the steering and suspension components of your vehicle.